It's been just over a month since I moved from Carlsbad, California to Rockaway, New Jersey. My first week here was hot, with highs around 90°. By the end of the second week, it had rained 13 days in a row. Of course I complained about the rain – until today. The leaves are just beginning to change colors and many remain green, after all, it's still October. So, I really poopooed yesterday's weather reports of snow. Okay, maybe snow flurries, but when I heard forecasts of possible snow accumulations of several inches, I just brushed it off, "Ain't gonna to happen." Obviously, I couldn't have been more wrong. This morning, it started snowing. It was in the mid-30s, so the flakes clumped up into postage stamp sized clusters. As the day wore on, I figured that it would warm up and turn to rain. I'd seen this movie before, especially as a kid growing up on Long Island, hoping for a snow day. At most, I expected a light dusting – it'll all be melted by late afternoon, I thought. I moved my car out of the driveway and parked it on the street and then ran an errand in my wife's VW Bug. I was at CVS for about 10 minutes when they lost power. The store was now running on battery backup and the employees started ushering the patrons off the premises. We could make an immediate purchase while the cash registers and credit card machines still had battery power. I quickly bought two ice scraper brushes for the cars. By the time I got back to the Bug, it had an inch of snow on it. No sooner did I brush off the windows and head out of the parking lot than I could no longer see out of the side and rear windows. Every time I accelerated, the traction control kicked in for five to ten seconds. Even more unnerving was the fact that, as the car would slide and skid sideways - ever so slowly - I'd hit the breaks and hear the antilock system clicking away for what seemed like an eternity, "Please stop, please stop, please stop." When I got home, I parked the Bug in the driveway. As I started shoveling snow, I could hear the cracking of tree limbs, every five to ten minutes, as they came crashing down all around the neighborhood. I couldn't figure out why this seemed so strange – but something was very "different" which was causing all these limbs to fall. It wasn't until a few hours later when I realized why so many trees were collapsing. Normally, in the winter, when it snows, trees don't have any leaves. Not only are the leaves still on the trees, but most trees still have live, green, leaves. It wasn't just the combined weight of the snow and leaves that caused the tree limbs to snap. It was also the fact that the healthy, green leaves, significantly increased the surface area of the limbs. More surface means more snow sticking to the trees, which, in turn, means the trees now need to support a heavier load. After shoveling the driveway – which is a task I can't recall doing in over 25 years – it was time to move my Honda Accord from the street to the driveway. I was leery about leaving it parked on the street because of the passing snowplows plus the fact that the street in front of the house is a very steep hill. I watched several cars slide, skid, twist, and turn down the hill. They were getting way too close to my car. It seemed like it was only a matter of time before one of them would slam into my car if I left it parked on the street. I was sure that the SUV, in the following video clip, would skid into the back of my silver Accord after watching it make several failed attempts to enter their own drive way. Fortunately, they finally gave up and parked on the street. However, after multiple attempts, I, too, failed to get my car back in the driveway. I drove around the block three times. Each time, as I came down the hill, I simply could not turn into my driveway – the car just kept skidding straight. It certainly didn't help that the driveway is extremely narrow and it's surrounded by retaining walls on both side. All that I could do was leave my car parked in front of the house. About once an hour, a snow plow made a pass. With each run up and down the road, they've built up a protective wall of snow around my car. It'll be a pain to shovel out tomorrow, but, for now, I welcome it. I'm guessing that about six or seven inches of snow has fallen, so far. My next step is to meet my neighbors and become friends with them. Two neighbors fired up their snow blowers and each plowed about half a dozen driveways; and then they plowed the sidewalks. I need to get on their to-be-plowed list. 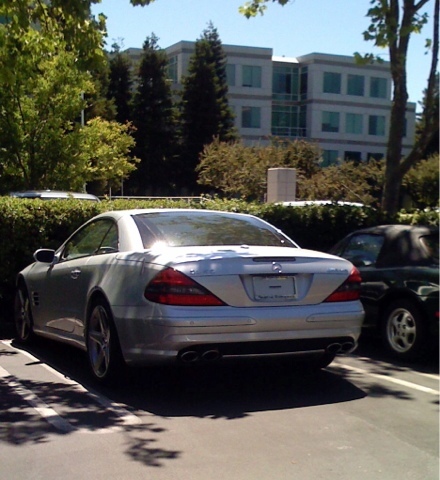 Yep, it's true that Steve Jobs used to drive around without a license plate. I've seen it, touched it, and photographed it. But I think the license plate loophole theory is wrong. Otherwise Steve would have had temporary paper tags on his car (or, perhaps, he just didn't display the tags). Steve may have just driven around without ever registering his car - or, maybe, he simply didn't attach the license plates to his car. I doubt that he was getting a new car every six months. But, that's what's being reported – so, maybe it's true. I just find it hard to believe. I [Isaacson] said, "Why don't you have a license plate?" He said, "Well, I don't want people following me." I said, "Well not having a license plate is probably more noticeable." He said, "Yah, you're probably right. You know why I don't have a license plate?" I said, "Why?" He said, "Because I don't have a license plate." I think he felt the normal rules just shouldn't apply to him.